Home Tags Posts tagged with "ukraine elections"
President Vladimir Putin has said he will respect the outcome of Ukraine’s presidential election on May 25. Speaking in St Petersburg, Vladimir Putin said Russia was prepared to work with whoever was elected Ukraine’s president in Sunday’s vote. It is the first time Vladimir Putin has explicitly indicated that he will accept Ukraine’s election result. Violence in the east, particularly Donetsk and Luhansk, has seriously disrupted preparations for the polls. Some pro-Russian separatists have warned people against voting, while election officials and voter lists have been seized at gunpoint. At least 14 government soldiers were killed in clashes with pro-Russia separatists in the Volnovakha area south of the city of Donetsk on Thursday. Further clashes were reported on Friday between pro-Russia separatists and self-defense fighters in the Donetsk region, with reports of at least two people killed. The presidential elections were called after the last elected president, Viktor Yanukovych, was deposed in February amid mass protests against his pro-Russian policies. “We understand that the people of Ukraine want their country to emerge from this crisis. 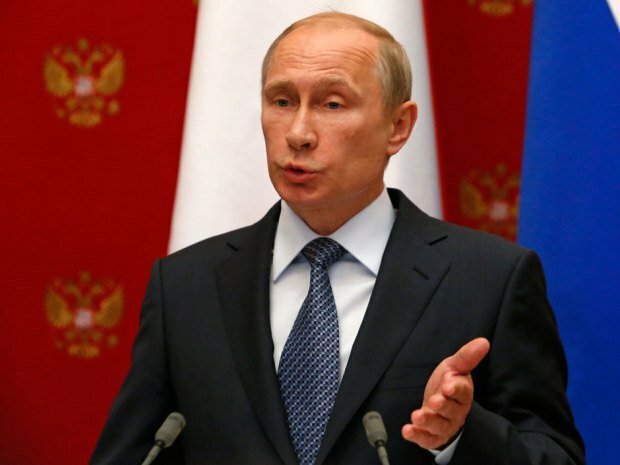 We will treat their choice with respect,” Vladimir Putin told an economic forum in St Petersburg. “It would have been better to hold a referendum and adopt a new constitution. Under the current constitution (Viktor) Yanukovych is still in power,” he added. Vladimir Putin also voiced concern that Ukraine would join NATO and said that he hoped the leadership in Kiev would end military action in eastern Ukraine. He said he believed Ukraine had descended into “full-scale civil war” but denied that Moscow was behind acts involving pro-Russia separatists. The Donetsk and Luhansk regions followed Crimea in holding independence referendums earlier this month. All three votes have not been recognized by Kiev and its Western allies. Vladimir Putin says Ukraine’s May 25 presidential election is a step “in the right direction”. However, the Russian president said the vote would decide nothing unless the rights of “all citizens” were protected. Ukraine’s interim PM Arseniy Yatsenyuk described as “hot air” Vladimir Putin’s call for an independence referendum, planned this weekend by separatists in the east, to be delayed. Vladimir Putin also said that Russia had pulled back its troops from the border, as tension remains high. Moscow has said it will protect the rights of the largely Russian-speaking people in the south and east against what it calls an undemocratic government in Kiev. Kiev has rejected pro-Russian activists’ demands for greater autonomy, fearing it could lead to the break-up of the country, and has sent in troops in recent weeks to seize back official buildings occupied by rebels. Vladimir Putin suggested that Kiev’s military operation in eastern Ukraine could be halted in exchange for a postponement of the referendum scheduled to take place in several areas on Sunday. Arseniy Yatsenyuk accused Vladimir Putin of “talking through his hat”. Earlier on Wednesday, pro-Russian separatists took back the city hall in the southern port of Mariupol after it was briefly taken over by Ukrainian government forces. 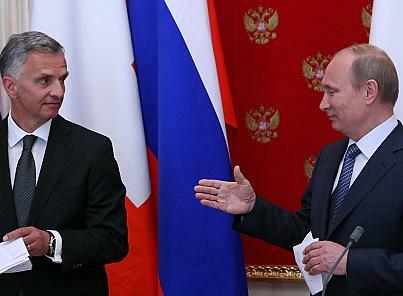 Vladimir Putin made his suggestion after talks in Moscow with Didier Burkhalter, the Swiss president and current chairman of the Organization for Security and Co-operation in Europe (OSCE). Vladimir Putin also said he had pulled back Russian forces from the border with Ukraine to “places of regular exercises, at training grounds”, although NATO said it had “not seen any significant change to the disposition of troops along the border”. 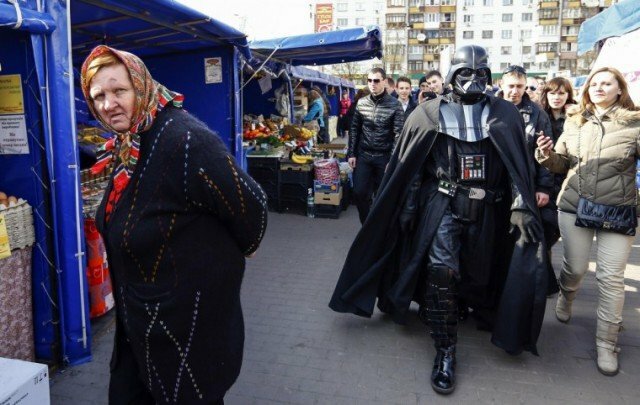 Darth Vader’s bid for Ukraine’s presidency has been rejected. The man, who appears in the costume of Darth Vader and is often accompanied by people dressed in other Star Wars outfits, was nominated for the presidency by the Internet Party of Ukraine. Earlier he told the party’s congress that he wanted to turn Ukraine into “a galactic empire”. Ukraine’s Central Electoral Commission says parts of Darth Vader’s application were “questionable” and some paperwork was probably forged. Apparently, the man is really an electrician called Viktor Shevchenko, who changed his name to Darth Vader in March. At least one commission member suggests Darth Vader’s campaign could be an attempt to discredit the upcoming election – possibly by Russia, which does not recognize the Ukraine’s interim government. “It may seem like an innocent joke, but someone paid 2.5 million hryvnyas [$227,000] for this joke,” says Ihor Zhydenko, referring to the deposit that must be given along with the application. Ihor Zhydenko adds that Darth Vader might run for the presidency in Russia, where he has received extensive media coverage. “They already have little green men,” he says, referring to Russian troops in the Crimea region. Twenty-three candidates have been registered to run in the snap presidential election in Ukraine on May 25. Former boxing champion and leading politician Vitaly Klitschko has pulled out of Ukraine’s presidential elections planned in May. 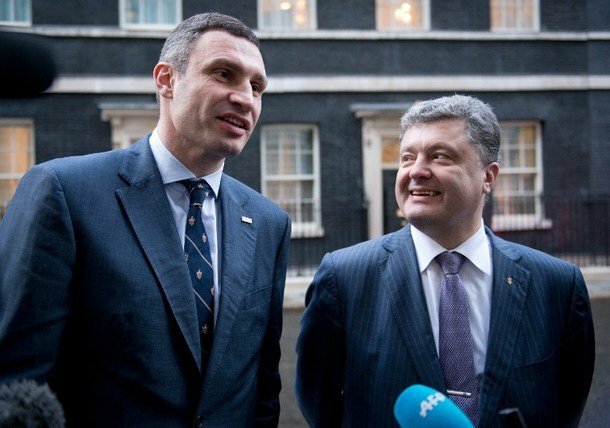 Vitaly Klitschko said instead he would back tycoon Petro Poroshenko. Both men played a key role in months of street protests that led to the ousting of President Viktor Yanukovych. Vitaly Klitschko, 42, announced his decision to pull out of the presidential race at his Udar (Punch) party’s gathering in Kiev on Saturday. “The only chance of winning is to nominate one candidate from the democratic forces,” he said. He stressed that a contender with “the highest chances to win should be running” for the presidency. “Today, Petro Poroshenko is this candidate,” Vitaly Klitschko said, reminding supporters that the two politicians had stood and fought shoulder-to-shoulder at the protesters’ main camp in Kiev – the Maidan. Petro Poroshenko, 48, has already declared his intention to enter the race. The owner of the popular Roshen chocolate company, Petro Poroshenko is widely known in Ukraine as the “chocolate king”. He has held a number of cabinet portfolios under different presidents in the past decade. On Saturday, Petro Poroshenko said that – together with the Udar party – “we declare our goal is a new Ukraine”. Vitaly Klitschko’s withdrawal means the race is likely to be between Petro Poroshenko and former PM Yulia Tymoshenko. Several former supporters of Viktor Yanokovych have also announced they will run. The Party of Regions, to which Viktor Yanukovych belonged, on Saturday backed former Kharkiv governor Mykhailo Dobkin to run for the presidency. The May 25 elections are seen as a crucial step in leading Ukraine out of the country’s deepest political crisis since its independence in 1991. An interim administration is currently in place in Kiev, led by acting President Olksandr Turchynov and PM Arseniy Yatsenyuk. Russia says the current authorities in Kiev came to power in a coup and are, therefore, illegitimate. Ukraine – backed by the West – denies the claim. Moscow formally annexed Crimea after the predominantly ethnic Russian region held a referendum earlier this month which backed joining Russia. Latest opinions polls give Petro Poroshenko about 25% of the vote, ahead of his presidential rivals, while Vitaly Klitschko and Yulia Tymoshenko are lagging far behind. However, Yulia Tymoshenko, 53, who was released from prison last month following the overthrow of Viktor Yanukovych, is expected to mount a strong campaign. In all, 15 contenders are planning to challenge for Ukraine’s presidency.